Handsome leather upholstery paired with a chic shape and an abundance of traditional nailheads make for a piece of furniture you'll be proud to show off to all your friends. This spacious leather sofa features a comfortable seat with loose cushions and tall track arms marked with a stunning nailhead border. Includes twelve knife-edged toss pillows and one kidney pillow in a medley of complementing fabrics. The Latitudes - Port Royal Transitional Four Piece Sectional Sofa with RAF Chaise by Flexsteel at Jordan's Home Furnishings in the New Minas, Halifax, and Canning, Nova Scotia area. Product availability may vary. Contact us for the most current availability on this product. 1373-29 Armless Love Seat 1 65" 40" 36"
1373-27 LAF Love Seat 1 71" 40" 36"
1373-231 Corner Chair 1 40" 40" 36"
1373-26 RAF Chaise 1 65" 38" 36"
Fabric Options The Latitudes Collection is crafted using beautiful, natural leather which is enhanced and softened using the latest technology. 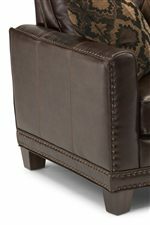 Then, depending on the design of the leather, is hand-rubbed, hand-finished, or hand-wiped, adding distinctive character. The Port Royal collection is a versatile and handsome way to furnish your living room that's smack dab on the cutting edge of furniture fashions. Taking inspiration from industrial, sophisticated transitional, and steampunk styles, the Port Royal leather sofas and chairs feature an intricate nailhead stud border that instantly catches the eyes. Tapered wood legs and complementing fabric toss pillows complete the piece with charm and flair. High quality construction methods like our time-tested Dualflex springs and softly supportive seat cushions ensure that this is a smart purchase. Choose from a sectional sofa, chair, ottoman, loveseat, or standard sofa in this timeless and artful style. The Latitudes - Port Royal collection is a great option if you are looking for Transitional furniture in the New Minas, Halifax, and Canning, Nova Scotia area. Browse other items in the Latitudes - Port Royal collection from Jordan's Home Furnishings in the New Minas, Halifax, and Canning, Nova Scotia area.